Yes, it’s the annual family journey to the French Pyrenees for some skiing. I, however, am not really a huge fan of hurtling down a mountain at 60mph, so for me it’s snowshoes and hiking. We went up to Camurac our local, very unpretentious, little ski station. I helped the young ones into their gear and wished them well on the slopes. With that out of the way I put on my snowshoes and headed off. Behind Camurac ski station is a hill/mountain by the name of Serre de Moncamp. I trudged through the crunchy, virgin snow in the glorious sun, stopping every-now-and-again to refresh myself with an icicle ice lolly. Icicle ice lollies – very tasty! 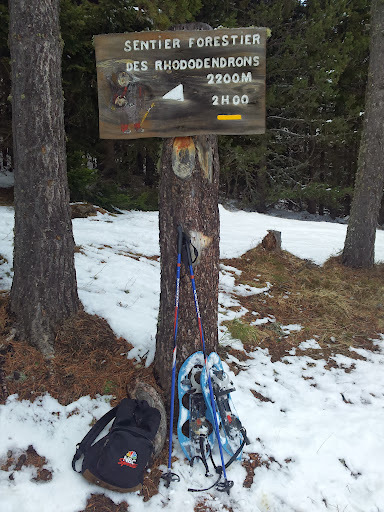 I reached the summit in 90 minutes, the Pyrenees were laid out before me, I was not missing work. Back to Camurac. 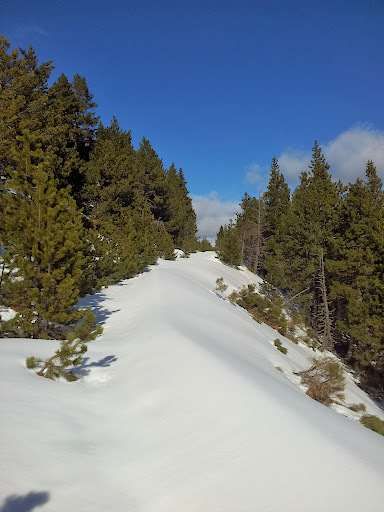 This time I decided to drop down into the valley on the other side of the ski-station and then climb up to the ridge and walk around to the high ski runs via the Roc de Quercourt, probably 10km or so, as the bird flies. A mountain stream runs along the valley floor. 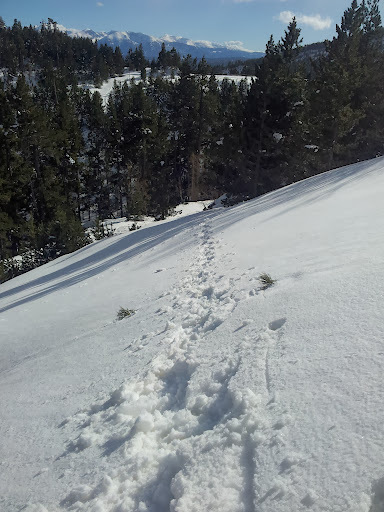 The trail at first showed signs of other hikers but they dropped off after a while and once again I was making tracks on my own through the snow. There were plenty of animals tracks though, deer, wild boar, rabbits etc, not that I saw any beasts as such. The climb up to the ridge was exhausting. Walking straight up a hill is tiring in any condition, in snow it’s double that. I took it slowly, stopping frequently for a breather and chunks of spicy French sausage and what a delight that was! At the summit I started on the ridge walk. Everywhere I looked : white snow, grey clouds, black mountains. Fabulously beautiful (and ever so slightly threatening). I reached a lonely mountain crossroad and began to wonder at the risks I was taking. Only two hours left of daylight and I wasn’t yet at the Roc de Quercourt. What if I didn’t reach Camurac before the last of the light? There would be no moon or starlight and I had no torch…suddenly the perils of mountains in the winter became very, very apparent. But two hours? Yes, I could do that without any problems! I banished these dark thoughts, took a compass reading and continued on my way. I reached the Roc without delay and an hour later was sitting in the bar at the ski-station sipping on a bottle of Pelforth beer. (Note to self: Next time out on the mountains make sure you have a torch!). 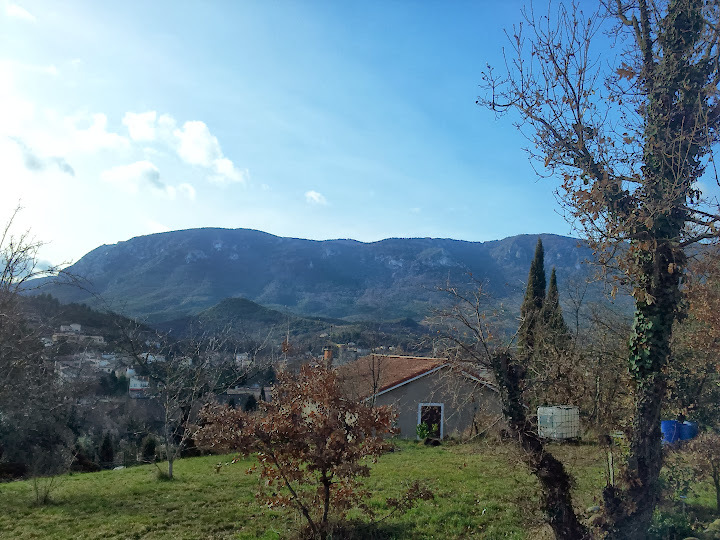 Below is the ridge to the south of the town of Quillan, I see this every day when I’m down in the Pyrenees, it is sooooooooo inviting, I mean, how can anyone possibly NOT want to climb up to the top of that ridge? So one day I obtained a shore-leave pass from the ski slopes and headed up to the top of the ridge. The day started a little drizzly but who cares? I’m in the woods, I’m on a mountainside, I have spicy French sausage in my rucksack, so what if it rains a little! I saw an odd looking tree. From the ridge I saw Quillan and the Aude valley laid out before me. I watched a family of hawks drifting lazily through the air. I saw some great wild camp spots but I also saw wild boar activity right by those wild camp spots…I guess they have more of a right to the mountain than I. The descent gave some wonderful views of Les Trois Quilles (from which Quillan takes its name). I arrived back in Quillan without having seen a single other person on the entire hike. 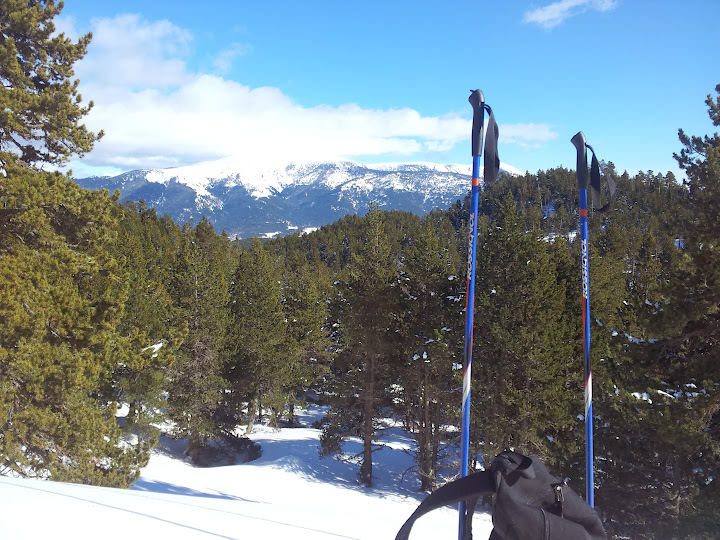 We went to a different ski-station, this one is at Puyvalador, further south than Camurac. As per usual I helped the youngsters into their various bits of gear and waved them off to the slopes. Duties discharged I went off to tackle the ‘Sentier Forestier Des Rhododendrons’, a waymarked trail just by the side of the ski-station. This was a beautiful hike uphill through snowy woods. At the highest point of the trail I went off on my own following what was clearly a track though there were no footprints anywhere to be seen in the snow. It was a beautiful walk. The untouched snow, the blue, blue sky, the mountains, the lovely, deep silence, I couldn’t help but grin as I walked along. The snowy path led me to a wood where I sat on a log in the sun and listened intently for the sounds of animals but they kept themselves well hidden away. Every-now-and-again, the summit of the highest local mountain, Madres, popped its head through the cloud cover. On our last full day in France, Jo joined me on a circular walk from Rennes les-Bains to Sougraine and back again to Rennes. The first half of the walk was mainly through woods, following the river Sals as it made its way to its source at Sougraine. At times the countryside was reminiscent of the fells of northern England. We arrived at Sougraine hoping to find a bar for a drink but alas the one place open appeared abandoned by its owners. We rang the on the doorbell for a while but no one answered, it’s a sleepy village. The centre of the village offered an attractive fountain but alas the water is not drinkable. We crossed to the other side of the valley and started the walk back to Rennes. As we climbed higher the scenery grew all the more outstanding. We rested at the summit. And looked over westwards towards Quillan with the snow crested Pic de St-Barthelemy in the background. A a gentle hike through the woods led us back to Rennes for a well deserved beer. Where shall I start. First, your narriative was superb! My guess is you do a bit of writing, or perhaps more then a bit! The drive to go see what is “around the bend” is a hallmark of a true outdoors man. Hiking is rewarding in so many ways. The horses, mountain views, Et cetera wouldn’t have been as big an impact without your running dialogue. Most folks don’t take the time to open a link and actually read. I do. Thank you so much for immersing me so deeply in your journey. You are very welcome Martin! I’ve never been bothered by wild boar when wild camping although they do sound a bit scary when they’re thundering through the undergrowth. Have a torch handy for when they get too close. Hi Luggy, that’s good to hear, I’m thinking of taking my hammock next time to keep myself up off the ground. 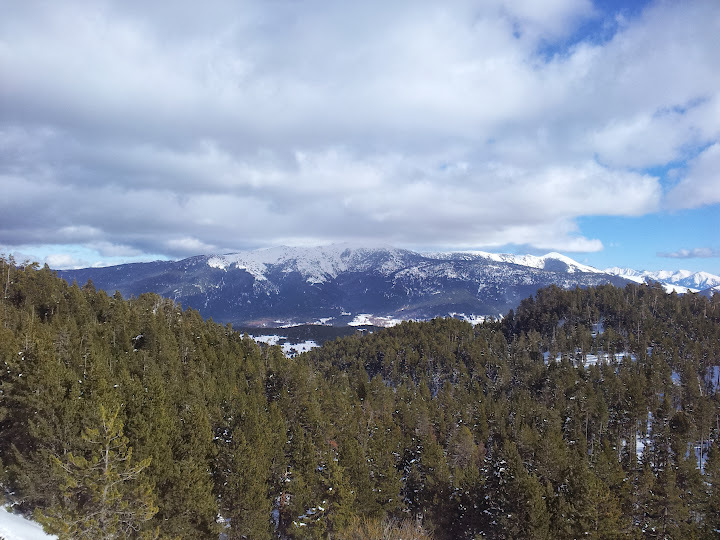 It makes me want to pack a bag and go to the Pyrénées right now. Your account, especially the photos, makes me want to go there and explore all around.